Johnson's Map Illustrating the Principal Features of Meteorology. Johnson's Map Illustrating the Principal Features of the Land and the Co-tidal Lines. Johnson's Map Showing the Distribution and Limits of Cultivation of the Principal Plants Useful to Mankind. 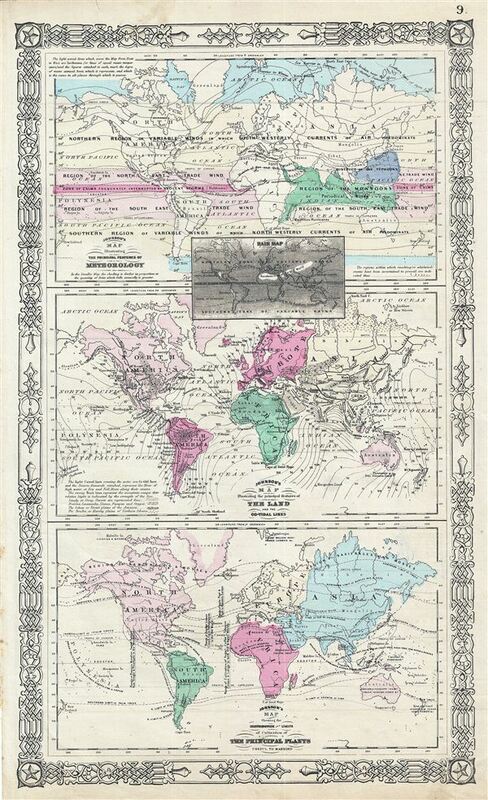 This is one of the thematic world map sets from the rare 1864 edition of Johnson and Ward's New Illustrated Atlas. It features three maps within a single border. The first map depicts the world's meteorological patterns and includes an inset rainfall map. The second map depicts the world's co-tidal lines with notations regarding world table lands and lowlands. The third map displays the distribution of important commercial plants around the globe, focusing on the major cash crops of the time: coffee tobacco and cotton. All three maps name individual countries though are without specific boundaries. The map features the fretwork style border common to Johnson's atlas work from 1863 to 1869. Steel plate engraving prepared by A. J. Johnson for publication as plate no. 9 in the 1864 edition of his New Illustrated Atlas. Very good. Coats of Arms of various states on verso. Minor ovreall toning.